International Family Law: "International family law expert offers his insight"
"International family law expert offers his insight"
Cases involving children, spouses and families can often be complicated when one country’s laws are involved. When those cases reach across borders and time zones the complexity increases. Now an attorney who the media has often turned to for help in understanding a complicated international family law issue – like child custody – is offering his insight in a new resource to assist United States attorneys involved in family law and collaboration with family lawyers across the globe. 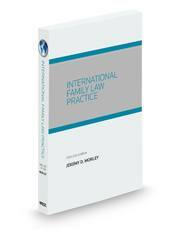 Jeremy Morley provides expert guidance in International Family Law Practice, published by West. The topics Morley focuses on in his book include international marriage and divorce, international prenuptial and postnuptial agreements, international divorce planning, recognition of foreign divorces, international child support and custody, international relocation of children and international child abduction. Morley has been involved in several high-profile international cases involving children and families in recent years. He’s also the co-chair of the International Family Law Committee, International Law Section, of both the American Bar Association and the New York State Bar Association. More information on International Family Law Practice is on the West Web site. And, Morley has some more information on his work and his media clips on his Web site, international-divorce.com.